Thousands of Russian professionals have lost hope for a better life in cities. They have taken to the forests to create their own utopias independent of the state. The eco movement has increased several fold in recent years. Some have found harmony, others feel disillusioned. Yevgenia Pystina is a medical doctor who was once a scientist at the Novosibirsk Medical Institute, the prestigious research facility in Siberia’s largest city. Three years ago, her husband, a concert pianist, told her about some green movement activists living off the grid on communal land about 75 miles north of Novosibirsk, along the banks of the Ob River. Pystina, her husband, and her seven- and eight-year-old daughters now live among 51 other families in the Land of Plenty commune whose members range in age from one to 91. New communities of homesteaders have sprung up across some of the most remote sections of Russia in the past decade, including Siberia, attracting thousands of Russians in search of a simple, self-sufficient and environmentally friendly lifestyle free from state control and big city corruption. The number of “eco-communes,” as they are called in Russia, has grown dramatically in the last decade, and the movement back to the land is drawing professionals weary of the country’s corruption, pollution and new consumerism. A tall, slim woman, with a long dark braid, Pystina sings through her busy day, stacking cabbage heads on her veranda, pouring her honey in cans for the winter, and painting eggs with her daughters, Angelina and Polina. “Since the day I moved to the Land of Plenty commune, my new interests in art, singing, science and agriculture wake me up every morning,” she said. Not everyone is charmed by the romantic aspirations of these activists. The Russian Orthodox Church has criticized the communes as sects selling false Gods. And some suspicious local authorities in rural areas have challenged the attempts of various communes to establish ownership of the land they have homesteaded. Environmentalists at the Land of Plenty commune said they are not a threat, and every house is open to guests who want to visit and sample the commune’s honey, pumpkin pies, and goat milk. They also stress their differences with some of the religious communes that have also emerged in Russia at the same time. Organic farming forms the basis of the vegetarian diet followed by the commune members. Families here also believe in home schooling their children with members with particular expertise teaching that subject area. Pystina, for instance, teaches chemistry. Each household contributes something to the common good at Land of Plenty, members said. The family of Valery Popov, a former physicist, helps newcomers build their log cabins. The Nadezhdins, a family of dentists, serve as the commune’s bakers. Klavdiya Ivanova, a former music teacher, is famous for her hand-made, traditional clothes. Her husband, a former army officer, helps the commune recycle. Established environmental groups such as Greenpeace Russia welcome the eco-commune movement. “We welcome all green movements as they reflect a natural desire people have to live in harmony with nature,” Vladimir Chuprov, head of the energy-saving department at Greenpeace Russia. It is hard to get exact numbers of Russia who have moved into the wilderness. But clearly the numbers are growing. 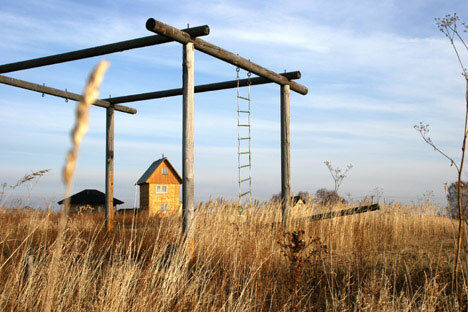 Dozens of ecological settlements have emerged in the last two years in the Altai Mountains, Karelia and on the Volga. Some have even spilled overseas. The Shambhala- Shasta Eco-Settlement in Ashland, Oregon, traces its roots to Russia, attracting the attention of nature lovers. Life on the land can be brutal. Last winter, the temperature fell below 50 degrees celsius in the Altai Mountains; starting the wood-burning stove in the freezing morning is a singular challenge, activists say. And as with any human enterprise there is internal discord and allegations of corruption, leaving some former commune dwellers disillusioned with their new utopia. Olga Kumani, a former crime reporter in Novosibirsk, quit big-city life in 2002. “I could not breathe in the city; the state system choked me,” said Kumani. In search of a better place, Kumani, a mother of three, joined the Charbai commune in Altai. “The commune leaders just wanted to control our money and exploit us for work around the commune,” said Kumani, who left to find an ever more isolated home. Kumani and her children now live among a community of 22 artists who make clay pots and flutes in a village in the Republic of Altai. But she finds even the artists’ community too stressful, with tense relations among the artists. “We are still searching for alternative options, for new solutions,” said Kumani, who contemplating a move to the most desolate parts of Siberia.